Osama bin Laden, al-Qaeda leader, has accused Barack Obama, the US president, of following the policy of his predecessor George Bush in "antagonising Muslims". "He has followed the steps of his predecessor in antagonising Muslims... and laying the foundation for long wars," bin Laden said in a tape released shortly after Obama arrived in Saudi Arabia on Wednesday. "Obama and his administration have sowed new seeds of hatred against America," bin Laden said referring to what he claimed to be a US support to Pakistan in its fight against Taliban in the Swat region, which has displaced 2.4 million people. Bin Laden warned the American people against the risk of extended wars because of the policies of the different US administrations. "Let the American people prepare for to harvest the crops of what the leaders of the White House plant in the next years and decades," he said. DUBAI: Al-Qaeda chief Osama bin Laden accused US President Barack Obama of following his predecessor George W. Bushâ€™s policy in â€˜antagonising Muslims,â€™ in a tape aired on Wednesday on Al-Jazeera television. â€˜He has followed the steps of his predecessor in antagonising Muslims and laying the foundation for long wars,â€™ he said in a tape broadcast shortly after the US president arrived in Saudi Arabia. Obama is on the first leg of a Middle East tour in which he plans to reach out to Muslims and try to advance regional peacemaking. â€˜Obama and his administration have sowed new seeds of hatred against America,â€™ he said referring to what he claimed to be a US support to Pakistani regime in its fight against the Taliban militia in the Swat region, which has displaced 2.4 million people. â€˜Let the American people prepare for to harvest the crops of what the leaders of the White House plant in the next years and decades,â€™ he said. "He has followed the steps of his predecessor in antagonising Muslims ... and laying the foundation for long wars," bin Laden said in a tape released shortly after Obama arrived in Saudi Arabia on Wednesday. No doubt. But who is Tim OSS man? I almost didn't recognize this thread with it's flashy meaningful new headline! 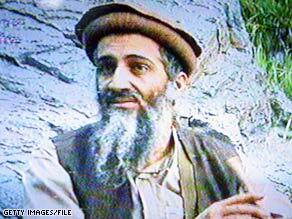 Message says U.S. policy on Pakistan has generated "seeds of hatred"
Osama bin Laden is seen in an image taken from a videotape that aired on Al-Jazeera in September 2003. (CNN) -- Al Qaeda leader Osama bin Laden purportedly issued another statement Wednesday, saying U.S. policy in Pakistan has generated "new seeds of hatred and revenge against America." Al-Jazeera, the Arabic-language TV network, aired segments of what it said was a "voice recording by bin Laden." This message comes as President Obama begins his trip to the Middle East, where he is visiting Saudi Arabia on Wednesday and, in Egypt on Thursday, is to make a major speech to the Muslim world. This would be bin Laden's first assessment of an Obama policy. CNN analysis of the audiotape as it aired indicates that the voice on the tape sounds like bin Laden's. Since the message was not posted on the usual radical Islamist Web site that carries statements from al Qaeda, it is believed that this latest message was hand-delivered to the TV network, based in Doha, Qatar. It was believed to have been recorded several weeks ago when the mass civilian exodus occurred because of fighting in northwestern Pakistan. The message refers to the conflict in Pakistan's Swat Valley -- where Pakistani troops are taking on Taliban militants -- and it argued that Obama is proving that he is "walking the same road of his predecessors to build enmity against Muslims and increasing the number of fighters, and establishing more lasting wars." The speaker cited strikes, destruction and Obama's "order" to Pakistani President Asif Ali Zardari "to prevent the people of Swat from implementing sharia law." "All this led to the displacement of about a million Muslim elders, women and children from their villages and homes. They became refugees in tents after they were honored in their own homes," the message said. "This basically means that Obama and his administration put new seeds of hatred and revenge against America. The number of these seeds is the same as the number of those victims and refugees in Swat and the tribal area in northern and southern Waziristan." The message added: "The American people need to prepare to only gain what those seeds bring up." In March, bin Laden also issued purported messages. He called for Somalia's new president to be overthrown and called Israel's recent offensive in Gaza a "holocaust." Bin Laden has delivered many messages over the years, but the last video message from him was in early September 2007. In the video message, he criticized U.S. Democrats for failing to stop the war in Iraq; spoke of the anniversary of the U.S. bombing of Hiroshima and Nagasaki during World War II; the troop surge in Iraq; and world leaders such as French President Nicolas Sarkozy and British Prime Minister Gordon Brown. CNN Senior Editor for Arab Affairs Octavia Nasr contributed to this report. lest we forget, or in case this becomes lost in the PROPAGANDA, evidence from Steven Jones et al peer-reviewed investigation shows that HUNDREDS OF TONNES OF MILITARY-GRADE NANO-THERMITE was used to bring down the WTCs in 2001. Where did that comes from? Some cave in Afghanistan? Then they were allowed in. They were helped to install it somehow. to do a photo-realistic Osama with an Osama voice on an Osama video. that job and deliver good work. Osama wants to kill us instead of Voldemort. we will never see Osama bin Laden in court, he will be murdered by those ubquitous Powers That Be. Voldemort He was supposed to be dead too, remember? Bin Laden is a ghost !